When you know the names, uses and habits of the plants and trees you see, they become like friends to you. And when you need their help, you can turn to them for help, such as food, medicine, fiber and fuel. But it's important that you learn plants properly! If you only "kind of" know a plant, it is very easy to confuse it with a look-alike. But when you REALLY know a plant, it becomes virtually impossible to do so. Fortunately, there are very few plants that are dangerously toxic in our area, especially at low doses. But not zero. Just a small taste of hemlock can kill (3 species in our area...). For this reason, we teach students to identify hemlocks, but do not teach the edible look-alikes of these species. We've developed structured journals that are intended to help students of diverse ages and abilities learn plants thoroughly and efficiently. The journal sheets guide students in careful observation of the plant, and in noticing key features needed for good identification. How many coaches? There should be one plant coach helping no more than 4 students. So a class of 10 might have 2 coaches working with 4 students. Weather conditions should be dry, and not too cold or windy for comfortable writing. Check with the instructor about plant selection; it's usually preferable to journal plants that can be observed in class on the scheduled day. The instructor may know what plants are out, and where to find them. Plant availability varies with location and time of year. Plant 20 - 30 minutes per plant. Probably best to journal only 1 or 2 plants per day. 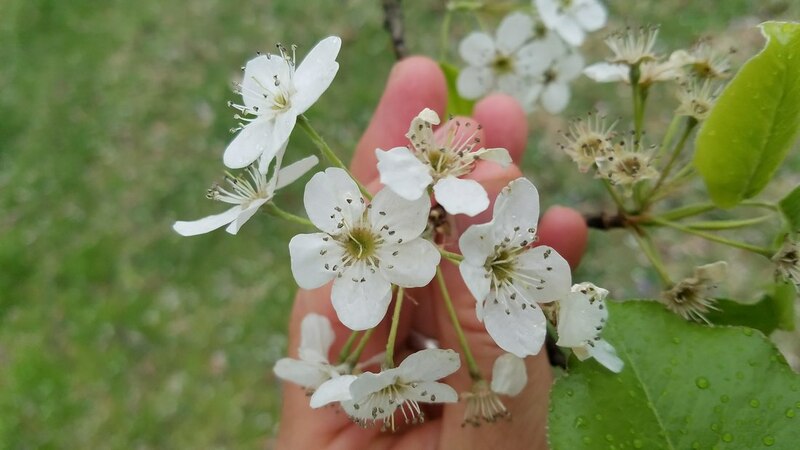 If plants are edible and abundant, it is encouraged to at least sample them, and potentially to prepare a meal of some kind as an additional activity. If a cooking activity is planned, then consider designating skills coaches for associated tasks, like fire preparation and clean up. Preparation at home: Fill out the front of the Plant Page at home. In class, check in with the coordinator and instructor about where and when to lead the plant journaling. 1a. As skills coach, when we arrive at the right place, you will finds plant for students to observe and journal. have an instructor confirm your plant identification. 2. The coordinator will assign a group for you to coach on the plant, bring your group over to the plant and introduce them to it. 3. Then have the students observe the plant carefully for 1 – 2 minutes, then draw/write any impressions in the Visual and Verbal sections. 4. Next, students should flip over the sheet, and study the plant; filling out the top boxes. 5 - 10 mins. 5. Then the skills coach shares findings for bottom boxes. 5 mins. 6. Students note final visual and verbal impressions on the back. 5 mins. Alternate - There is only one leaf attached to the stem at a time. 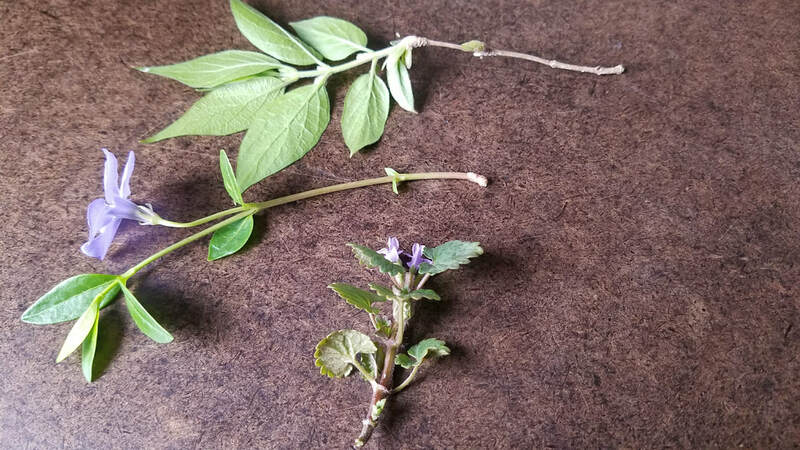 Opposite - Leaves are attached in pairs, opposite each other. Whorled - 3 or more leaves are attached at one point on the stem. 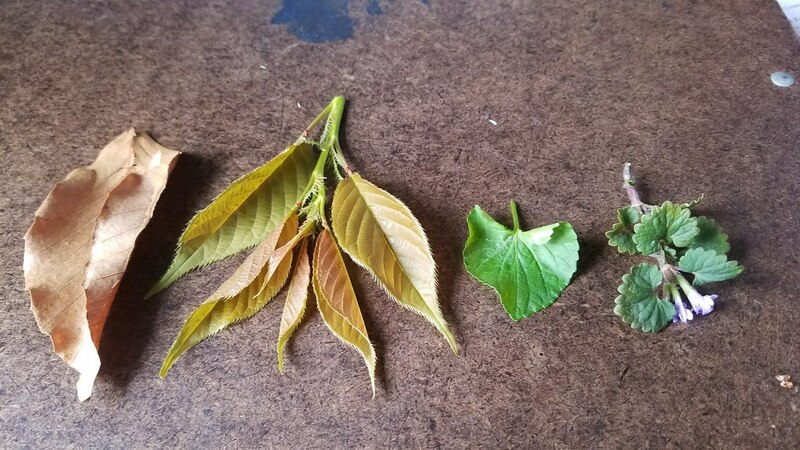 These are both alternate leaf arrangements. The top left plant is pretty straightforward, but the other plant is likely to confuse a beginner. Notice that each of the circled plant structures is one divided leaf, and that the leaves are attached to the stem one at a time at the stem, where the arrows point. See below for more on divided leaves. 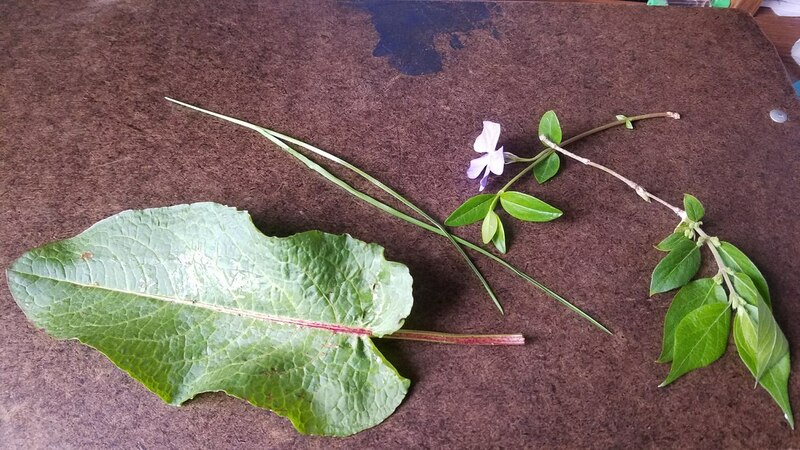 Three examples of opposite leaf arrangements. Look carefully to observe that the leaves are attached in pairs at the stems. Entire - The leave edges are even and unbroken. Toothed - The leaf edge has regular teeth, indentations, or wavy or scalloped edges. Lobed - The leaf has larger divisions that separate it into sections. 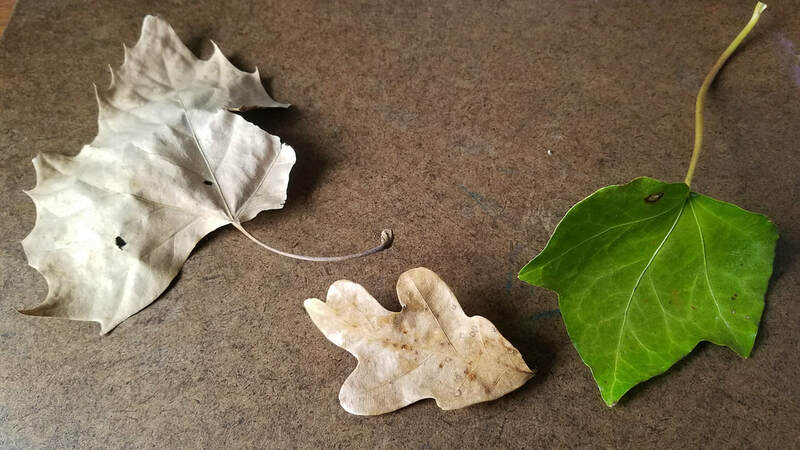 Divided - This includes leaves that are actually divided into leaflets, and those where the lobe divisions go almost all the way to the midrib of the leaf. See examples below. These are all entire leaves - there are not teeth, lobes or divisions. 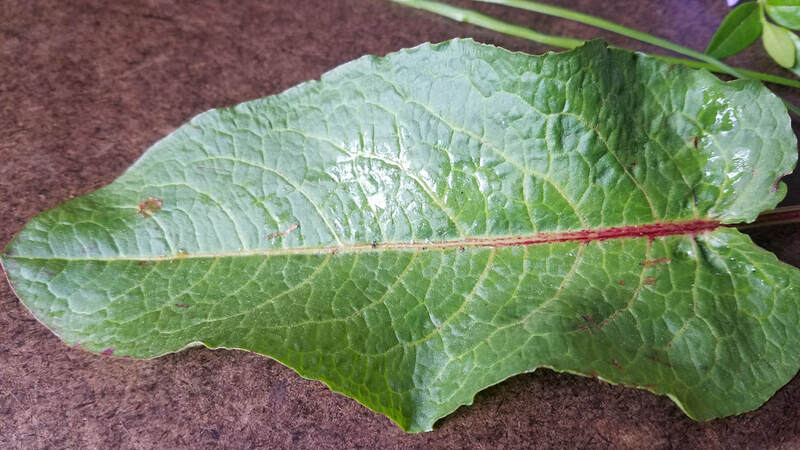 The large leaf is a little tricky, but if you look carefully below you see that the edge is kind of uneven, but does not have any actual teeth or divisions. Above: These are toothed leaves. Notice the beach leaf on the left has rather small and subtle teeth. Below: These leaves are lobed. They are divided into more significant sections than those above. Divided leaves. The leaves in the middle are compound leaves, composed of distinct leaflets. 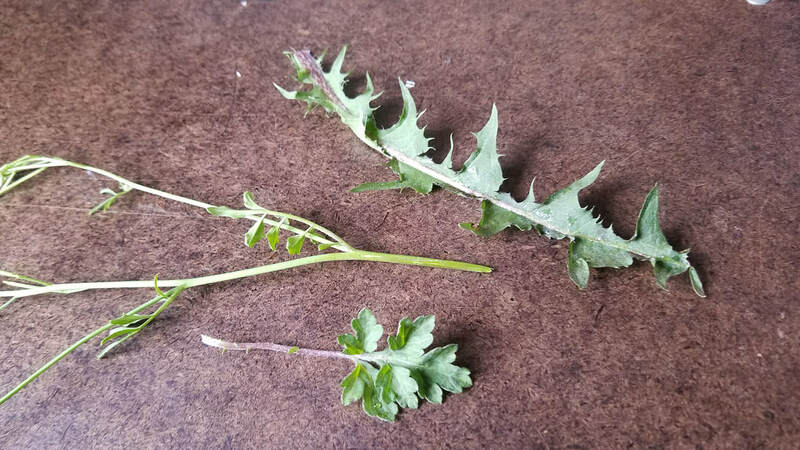 The dandelion leaf at the top has lobes that go almost to the midrib, as does the mugwort leaf at the bottom, so they are also considered divided. 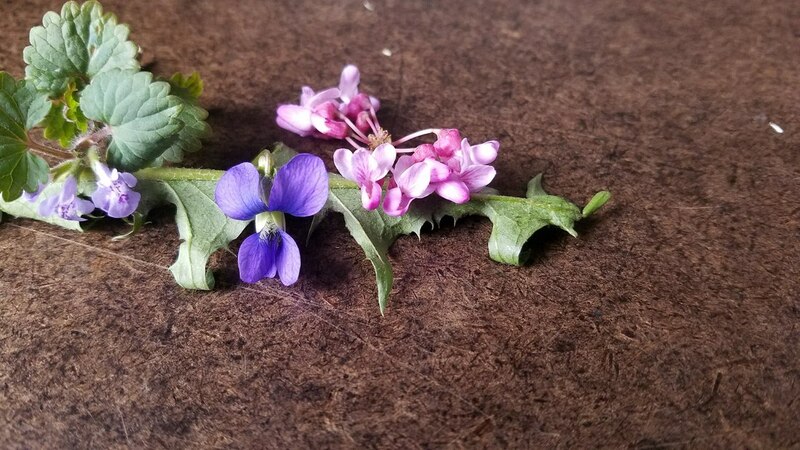 Regular: These flowers with 2 or more petals that are similar in size shape and color, and arranged evenly around the center, like spokes on a wheel. Irregular: These flowers are only symmetrical from side to side, typically having a lower and upper lip of some kind. Indistinguishable: No obvious petals or petal-like structures at all. 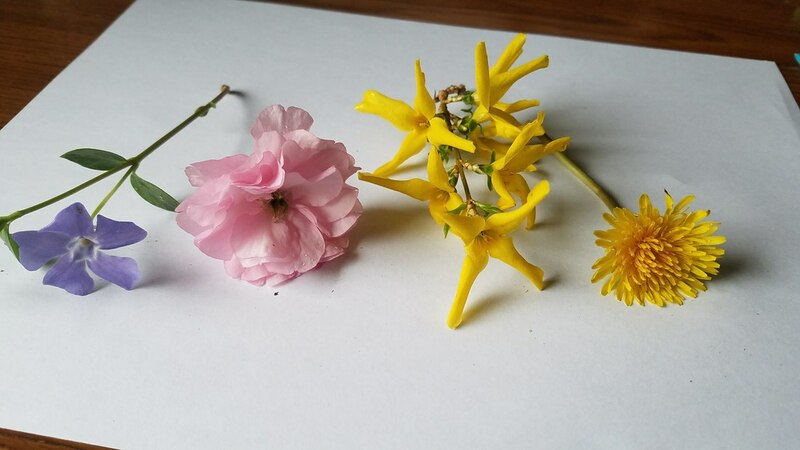 Above, and right: Regular flowers.